I just couldn’t wait any longer. I’ve been itching, and fair scratching, to dig up some of my new season’s spuds to see what, if any, action was going on underground. So when Jason wasn’t looking (he’s come over all territorial about these orderly rows of tubers), I snuck out with the spade and dug the last plant up from the first row of ‘Jersey Benne’ potatoes. The plants have only just started to flower but they’re ready to eat: I hauled eight waxy white tubers out of the soil. We boiled them with sprigs of fresh mint and ate them straight out of the pot. 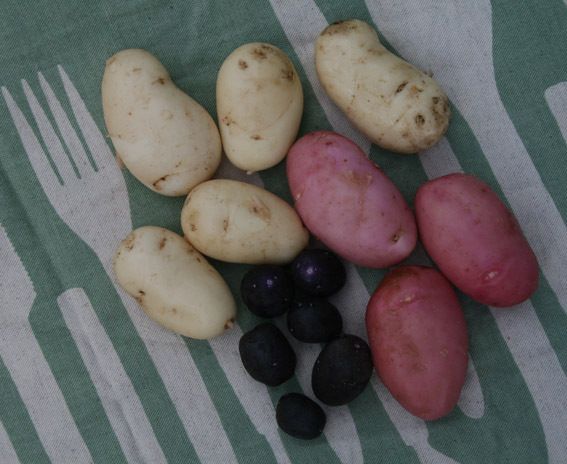 The pink tubers are the self-sown sprogs of the third-generation ‘Desiree’ potatoes that keep coming up in my asparagus bed. I thought I’d defeated them last summer, but I was wrong. At least we got a free feed from them. And the little dark purple marbles are ‘Purple Heart’. Guess they’re still a while off yet. Hi Lynda, there is something about eating the potatoes you have just “bandicooted”. To me they taste extra sweet. Well done. I said a couple of weeks ago ,we had dug our first lot of potatoes, and they were YUM. Did Jason ask where you had got them from??——. Thankyou for all the work you do to give us pleasure. Can’t wait to get the ” Homegrown Flowers” book. Bet Lucas has grown, and starting to get into mischief?? . It was super hot here today. Easily 25 or 26 deg. Lucas is growing faster than the brassicas. He’s worked out that if I stand within arm’s reach of a plant, he can grab a handful of petals or leaves, quick as a flash. I’m forever prising them out of his fist! I never know when to dig, and leave it too late (last year to wire worms… argh). I’ve got a very small garden and I’ve only just planted (two weeks ago) my first ever potatoes. I planted them in bags I bought from the warehouse. The leaves are just coming through the soil. I’m so looking forward to eating them. Good luck with your spuds Beverley. There’s nothing quite like homegrown new potatoes… yum! They look fabulous Lynda. I didn’t get my seed potatoes planted as early, but I now have greenery showing through. My question is do I cover all the leaves when I mound the soil up, or do I leave a bit showing through. Thanks and I love reading your blog. Leave the tips of the stems poking through the soil. Just mound up the sides. Good luck! Have you tried your Purple hearts again? Ours are a good size and taste yummy! We harvested 2kg from four seed potatoes on the weekend. They seem to have two skins, the outer one almost wipes off when you try to wipe the dirt off them. Brilliant – love these potatoes and other vegetable stores. Moved from 1,000sq metres to 8,000sq metres in mid January and loving it. Vege garden is our first priority as food is essential, flowers are extras. Got the 1st vegetables planted about 2-3 weeks after we moved in. Purple Heart was one of the seed potatoes I could get. The vege beds were completely empty but at least they were there! Did you enjoy your crop of ‘Purple Heart’? I’m going to plant them again next spring, for the colour alone.